Yesterday I posted about tofu wraps – very good ones too. If you haven’t seen the recipe you really should look. In that post I alluded to the fact that there would be leftover ingredients. Cooking the filling. It needs to be dry, but don't dry out the beef! That‘s often the case when one goes grocery shopping. You have leftover “stuff.” It’s one thing to have leftover onions when you buy a bag. They have a million uses. But what about some of the less usual ingredients, like tortillas? Unless you serve wraps twice in a couple days using them up requires a little thought. Some uses? In a strata, crisped in the oven for taco soup, or enchiladas. 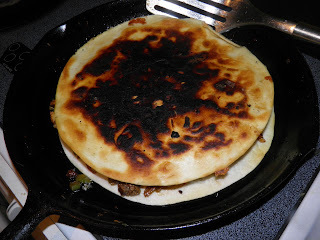 Another that should spring to mind is quesadillas. They’re actually one of my favourites. Essentially, quesadillas are two tortillas with filling between them that are pan fried and served with salsa, guacamole and sour cream. What you put in them is up to you but common ingredients are beef, pork or chicken with cheese. This is a great way to stretch a little meat to serve four people. In this recipe I purchased a whole 330 g of beef steak (regular price about $4) that was marked down 30% for quick sale. All that means is that it should be used in the next day or two. Sound good so far? That small amount of beef is enough to give four people 3 wedges of quesadilla. To make a meal simply serve some Spanish-style rice on the side. Since I was at the Atlantic Superstore I also purchased one of their small jars of salsa – a mango lime. I am not getting paid in any way to say this, but it was pretty tasty. I would recommend it. The lime in the salsa boosted the lime in the meat. It’s sometimes a challenge to use up “special” ingredients without repeating a dinner. But if you’re clever you can use up those purchases before they spoil and have completely different meal. Anonymous—that famous writer—said “Variety is the spice of life.” That’s doubly true in the kitchen. Heat the oil in a frying pan. Sear the steak on both sides. Remove and cut into small pieces (bite sized). Set aside. 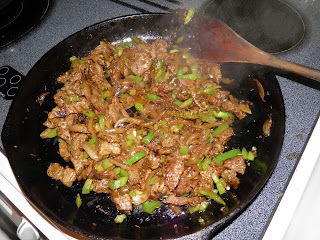 Add the onion, chopped chillies and green pepper to the pan. Sauté until the onions begin to brown slightly. Add the beef back in to the pan. Add salt, pepper, cumin and the lime juice and cook until the meat is no longer red and the pan is dry. This is your filling. Place one tortilla on a work surface. Grate the cheese. 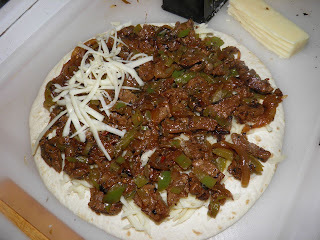 Add 1/4 of the cheese to the bottom of the tortilla and spread out evenly. Top with 1/2 of the beef mixture and then 1/4 more of the cheese. Place another tortilla on top. Flip the quesadilla and brown on the second side. Remove and keep warm while you repeat the process to make the second quesadilla. Cut each quesadilla into six wedges. Serve with avocado, salsa and sour cream. Yum.